The Japan Automotive Hall of Fame is a voluntary organization for awarding persons who made signi cant achievements for Japanese Automobile Industry, which is being independent from award- ing persons for public services with medal graded by Japanese Government. Behind Japanese Automobile Industry, there were various competent pioneers who challenged to newly explore the unknown elds, while its Industry has been at the world top level nowadays in product development, manufacturing technology and sales/service activity as well. 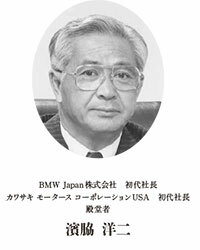 e Japan Automotive Hall of Fame is the exclusive organization in Japan for fairly awarding such pioneer’s precious achievement. Embarking for its Second Phase, I wish JAHFA will be further successful than ever before.